Weekly grocery shopping lands me with eggplants more often than not. The only way i knew how to make them was how we ate at the dinners held at my grandma's place - oily spicy garlicy good. We frequently called the latter the rajputi bengans- fiery red and bold flavoured. I wondered a week back though, if the latter could be made more figure friendly. So here's my take on one of my favourite vegetables. A guilty awesomeness then, made yummy and healthy now. To start - slit the eggplants lengthwise twice ,at a criss cross leaving the stem intact. Mix all the masala and help combine with drops of water to make a thick paste. Take some paste and rub in between the eggplant slits. Less is more, so dont overwork the paste in between slits. Take a nonstick pan- put 11/2 tsp oil , let it heat on medium to high. 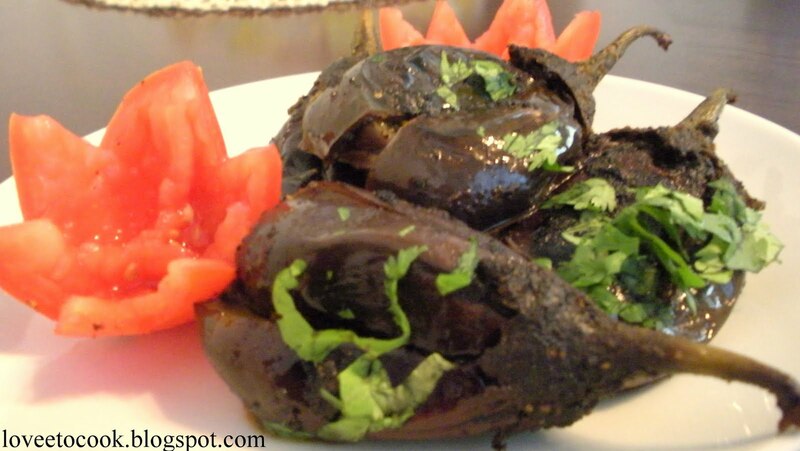 Remember eggplant acts like a sponge so put only the minimum required oil at first, adding more if the masala sticks. Once the oil is well heated add asofetida. Place each eggplant rubbed with masala in the pan (the stove is still on medium to high) , sprinkle some coarse salt for better roasting. Roast them for 2- mins each side on high heat, till a crust is formed. Once roasted , sprinkle some water (less is more) and cover. Steam them for 3-4 mins, turning them in between. Once done close the stove and keep them covered. After 2-3 mins , uncover and sprinkle some lemon juice on the eggplants and serve with a garnish of coriander leaves. Tip: Never crowd your pan when roasting. Take a bigger pan or roast in batches.